Understanding and predicting the changes in the morphology of the coastal zone, including the topography of the sea bed and the shoreline planform, in connection with waves, currents and tides, is a major challenge in geomorphology and coastal engineering. It is an interdisciplinary topic of interest to oceanographers, civil engineers, physical geographers, geologists, physicists and mathematicians. Coastal morphodynamics is a really challenging topic. 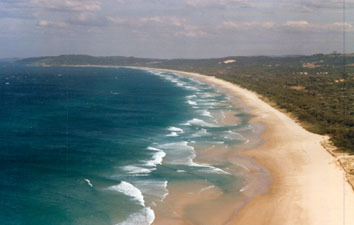 The coastal system is an open system exposed to a very complex external forcing (waves, currents, tides, wind, human interventions) at very distinct length and time scales, ranging from meters and seconds (individual waves) up to hundreds of km's and centuries (climate dynamics, geological constraints, anthropic influences). Secondly, it relies on the still very unknown and highly nonlinear sediment transport processes together with hydrodynamics (with turbulence). Finally, strong feedbacks between flow and morphology are essential giving rise to chaos and complexity and the emergence of self-organized behaviour that couples the space and time patterns of the external forcing with those arising from the internal dynamics. Our research group investigatesthe fundamental processes coupling hydrodynamics and morphodynamics that drive coastal morphology. In particular, we investigate the dynamics of cross-shore beach profiles, breaker sand bars, shoreline planforms and sand banks. The main aim are the self-organized morphological patterns like rhythmic surf zone bars, rip channels, shoreline sand waves and sand ridges in the continental shelf. Our approach is mainly based on mathematical modelling. The conceptual framework is to solve the hydrodynamics with a mobile boundary. The temporal evolution of the boundary depends in turn on the water motion through the sediment transport. Numerical simulation is combined with analytical tools provided by Applied Mathematics, especially differential equations and dynamical systems. We develop our own numerical codes and we also use available software from other institutions. From the experimental side we perform beach monitoring with video camera systems. In addition, a fluent cooperation with experimental research teams to validate model results or with coastal engineers to apply our knowledge is a common practice. UPC . Department of Applied Physics. FA.